I have always been skeptical of Chinese food in Thailand. I often found it either too sweet, greasy and oily, over sauced or with the flavors off-balance. With the exception of one restaurant, part of a Singaporean chain, I have invariably been quite disappointed with the Chinese offerings in Bangkok until I discovered Xinn Tien Di, located on the third floor of a deluxe shopping mall. After several meals there I can testify that the food is marvelous. Out of curiosity, I asked to meet the chef but was told that not one but a trio was behind the success of this restaurant. Sutee's close collaborator in the kitchen is Chaiwat Mapradit who is the working chef of Xinn Tien Di restaurant. He makes sure Sutee's vision of good food gets executed properly. He began cooking at age eleven and today at forty-five, brings with him more than thirty-four years of cooking experience that shows on all plates. The final clog in this trio is Surapol Chanprapatsorn, whose job is like a forager's. He seeks out the best raw material so that Chef Chaiwat can execute Sutee's vision. Now at age fifty, with his extensive experience in many Chinese restaurants in some of which he was the head chef, he brings ideas and makes sure that quality is the main driving force in Xinn Tien Du's dishes. At lunch time, you should begin with the selection of dim sum, an innovative array of the traditional tea snacks with a Thai twist. A tray with all the selections is brought for you to choose from. I found all quite tasty, light, and not greasy. A sure bet from the main menu is the Steamed Sand Goby with Chilli and Lemon Sauce. Sand Goby is a fish usually present in estuaries, lagoons, salt marshes, and along the coastal waters of Thailand. Here it is gently steamed with plenty of sliced fresh garlic, lime slices, and fresh chili. The result is a firm but silky textured fish dish that is at the same time bracing and refreshing, as well as delicious. Baked Soft Shell Crab with Salt and Chili, not really baked but fried and then stir-fried quickly in the wok to finish with salt and chilli, was perfect and greaseless. Sauteed Chinese Kale with Salted Fish is very popular among their Hong Kong customers and I can easily see why. Fresh batons of crunchy greens are stir-fried with bits of briny preserved salted fish which add a real zing and savory flavor to an otherwise bland dish. However, the pi�ce de r�sistance is their Peking Duck which is wondrous and a real bargain. The skin is extremely crisp with no trace of fat. It is served with green pancakes made partly with tea, which is highly unusual and innovative. You are then asked how you want the rest of the duck to be served, either stir-fried or in a soup. Opt for the delectable soup, which is full of duck flavor with preserved mustard greens and bits of Chinese celery. The broth is accented with special black peppercorns from Malaysia with a haunting aroma and taste. I could just sip on the soup all night. Should you be in Thailand, do visit this fine restaurant. You will find XINN TIEN DI at 999 Gaysorn Plaza, Unit 3F, 22 Ploenchit Road; Lumpini, Pathumwan, Bangkok 10330; their phone is: 66-2656-2114-5. 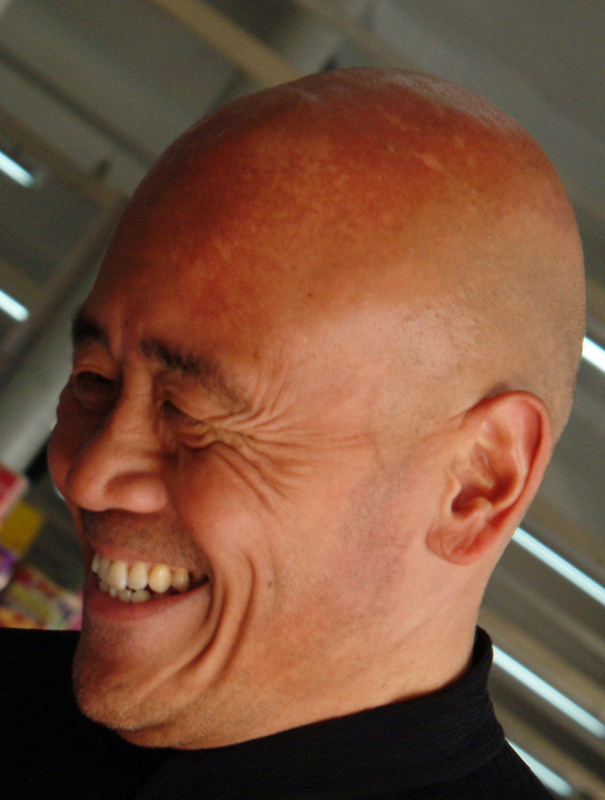 Ken Hom, honorary chairperson of this magazine, contributes frequently to the Financial Times Weekend on subjects food and eating; and shares many of his writings with us.